Disclaimer: This post contains affiliated links, which mean if you purchase from the links below I will be compensated at no cost to you! As always I only recommend product that I love and feel you will benefit from 🙂 read more here. I know the feeling of excitement, anxiousness, scared and feeling blessed that you’re finally bringing home your newborn baby from the hospital. So many different advice were given to you by your family members, mom friends, non-mom friends and even strangers. No matter how many advice you were given, how many books you’ve read, you will never be fully prepared to bringing home your newborn and what it means from there on. 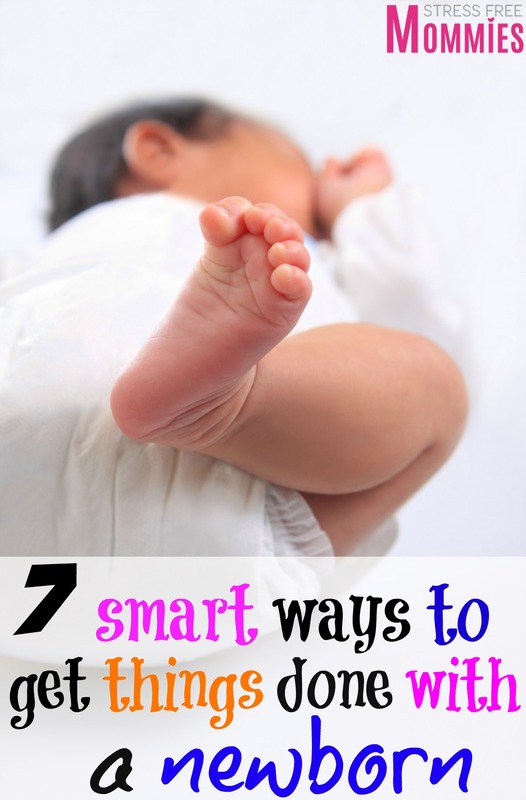 Learning these smart ways to get things done with a newborn will be very beneficial. You have to learn the ropes on your own and figure out what works for you and your baby. That’s all part of being a mom and even if you’re a first time mom or an experienced mom bringing home your third baby, taking care of a newborn is not easy but it’s very much manageable, we have no choice, haha! Today I’m sharing with you these smart ways to get things done with a newborn because let’s face it, life continues and those dirty dishes are not going to clean themselves. Yes, having a newborn will limit your work and house chore flow but finding smart ways to get things done around the house will help you feel and be more productive. 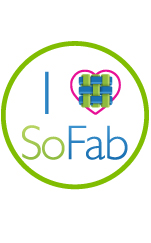 Are you ready to be productive while still taking care of your newborn baby? 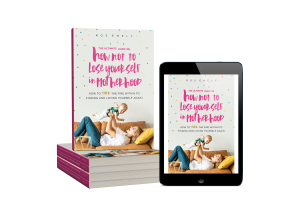 Then keep on reading mama because these tips are super simple, easy to implement and effective! An important tip that I learned from my family members is that if your baby is content and not crying there’s no need to be carrying him/her all of the time. You can get things done if your newborn baby is not used to the arms. You can cook, clean the house a little bit and even sit down to relax. Yes, I used to cuddle with all three of my babies but I didn’t get them used to my arms. You can take advantage of nap time either by taking a nap yourself or by being productive and using this time wisely. I do recommend napping if you arereally tired or you just simply want to, it’s okay to nap once in a while, so go for it! Now if you want to get things done around the house with a newborn, use nap time to your advantage. Take a shower, cook something quick, tidy up the house, read a book or enjoy your favorite show. If your baby is having a hard time going to sleep on his own, I recommend this book! You can really get a lot of things done while your newborn is taking a nap. I used to finish up my college work while my kids were napping. I would also cook and even clean my house. Granted my kids would take 2 to 3 hour naps, so it was great! Just use your newborn nap time to your advantage. Every time I would take a quick shower while my newborn baby was taking a nap, I would have sworn that I heard them cry. I really thought I was hearing them and so I would jump out of that shower like a wet cat only to find them sleeping like little angels, Lol. Tell me I wasn’t the only one! So feeding time is another smart way to get things done with your newborn. You can check your work emails, you can search up recipes for lunch or dinner time. You can even jot down ideas on your phone of what needs to be done or what your next blog post is going to be about (if you’re a blogger). If you go to school, you can purchase the books you need, brainstorm term papers and more. Use feeding time to your advantage as well, it’s just the small things that can make a difference later. You are still bonding with your baby but being productive at the same time. I used to bottle feed my babies and so it was sort of impossible to use my phone while bottle feeding. I did take advantage after I burped them and rocked them to sleep on my favorite rocking chair.As moms we always find smart little ways to make things work. 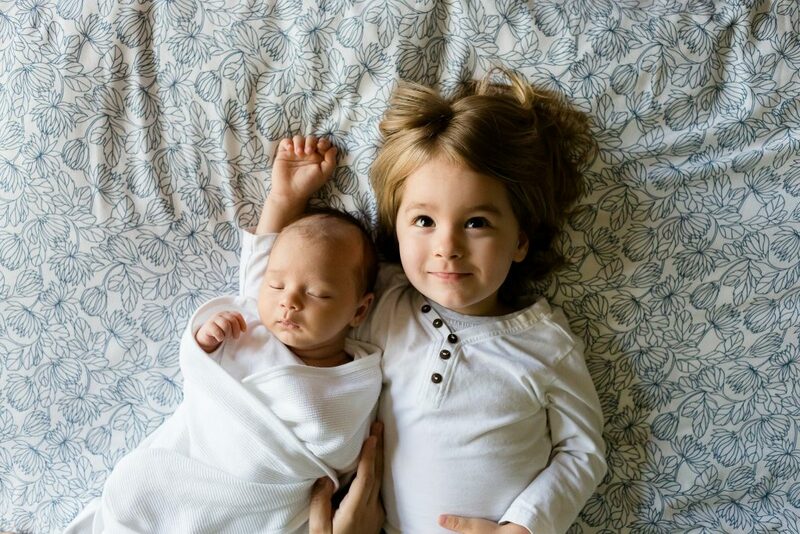 I loved keeping an eye on my newborn babies and so I didn’t leave them unattended even if they were happy and calm. I would take them with me when I would cook or take a shower. I had them on a baby swing or baby bouncerand it was the best thing ever. I could see what they were doing and still get things done! I would also bond with them by singing and talking to them, all while being productive. I honestly loved it and they did too. I took my kids to the bathroom with me, I would leave the bathroom door opened and they would be right there. Remember how I would hear their cries every time I would take a shower? This was my solution, to take a shower while they were awake and content. 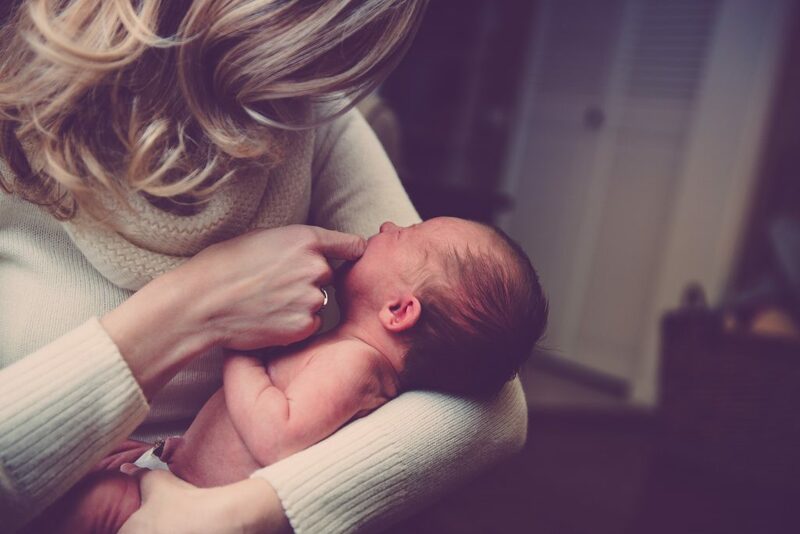 Newborn babies want to feel, see and hear their mom, so just take them with you and have them in a comfortable baby bouncer or baby swing, so you can get things done all while taking care of your newborn! I loved my baby monitorbecause once my baby was asleep, I could easily see them and be at ease knowing that they were happily sleeping. A baby monitor is a great baby product to have in hand because you don’t need to go to the nursery and check on your newborn every 5 seconds to see if they are okay. You can take the monitor anywhere that you want. You can have peace of mind while being productive and getting things done. It’s amazing. I would take my baby monitor to the kitchen and while I was cooking I would stare at it like it was a movie all while chopping my vegetables and cooking my rice. I used to have a routine with all three of my babies and I loved it. As you know, newborn babies sleep most of the day which is amazing and should work to your advantage. I would first change their dirty diapers, feed them, burp them, and they would automatically fall asleep. I would know at around what time they would fall asleep (morning, afternoon and evening) and so I was prepared in knowing what things I wanted to accomplish during those nap time breaks. My oldest child was a toddler when my twins were born. She always wanted to help me take care of the twins, which I found adorable and loving. I would give her easy tasks, like just be next to the babies while they all watched television. My twins would each be on their bouncer with their “seat belt ” on (always be on the safe side) and my toddler would sit in the middle of them. It was amazing to watch, I almost didn’t get anything done because I was just staring at the cuteness! This gave me about 15 to 20 minutes to use the bathroom, eat or fold the clean clothes. My daughter would also help me by picking out her siblings clothes before bath time. Small little tasks your toddler can help with, will help you get more things done around the house. Never leave a young child unattended with your newborn. Always keep an eye on them and remind them that you are right there looking at them. Kids are kids and sometimes they can be a little too rough with newborn babies. Never decline help from your family and friends who offer it. Don’t think that you have to do everything yourself because then you will feel exhausted and will be unable to get things done. Accept it and enjoy it, take a shower while you have company over helping you, wear a little bit of makeup, do your hair. Ask your hubby for help when he gets home from work, also ask your mom, sisters anyone that lives close by to you that can help and don’t feel ashamed of it. 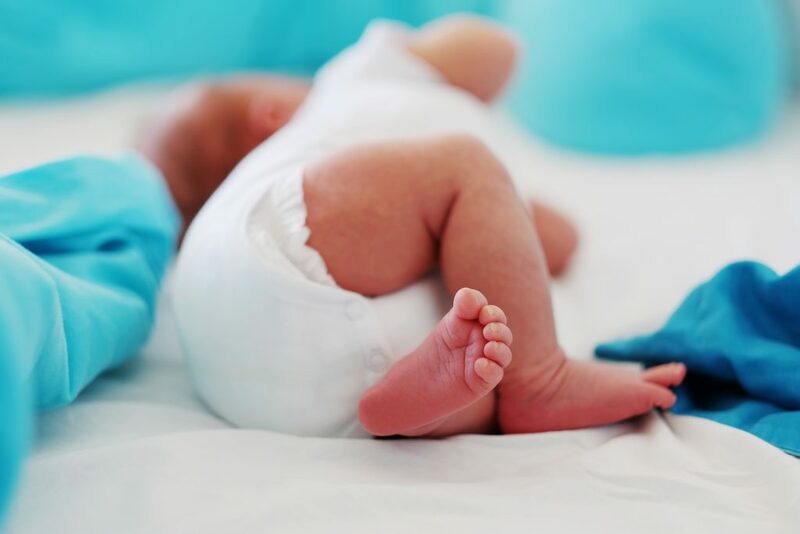 Taking acre of a newborn baby can have it’s limitations and that’s totally normal. You are trying to figure out life with a newborn and that’s okay. Finding the time to get things done with a newborn baby is key to being productive and feeling more like yourself. Remember that if you want to get things done with a newborn you will have to take advantage of their nap time and feeding time. Also, not letting your baby get used to your arms is a major bonus point, this will help you be much more productive during the day. Make sure to have a baby monitor to keep an eye on your baby and always get your older kids involved if you have any. 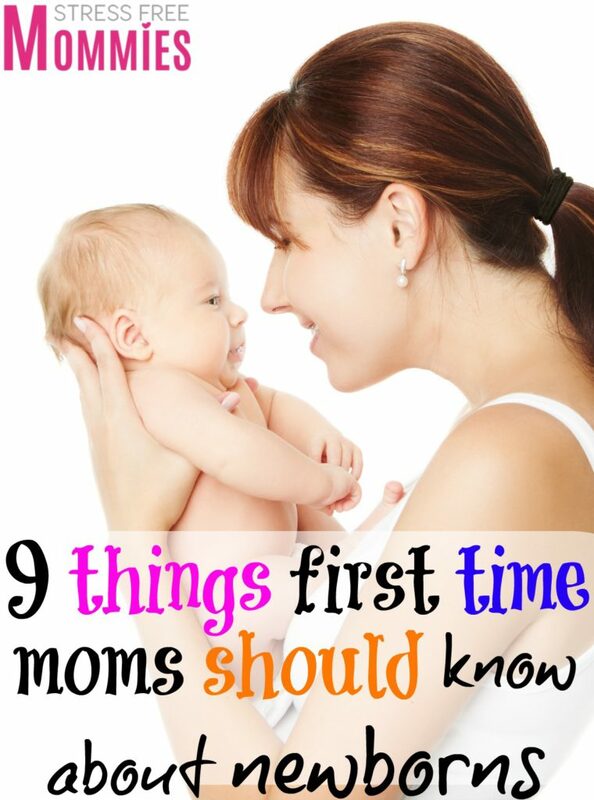 Do you have more tips on how to get things done with a newborn to add to the list? Please let me know! Conozco la sensación de excitación, ansiedad, miedo y sensación de bendición de que por fin lleves a casa a tu bebé recién nacido del hospital. Había muchos consejos dados a usted por los miembros de su familia, amigas que son mamás y amigas que no son mamás e incluso extraños. Algunos eran geniales y lo mantuvo en mente y algunos eran simplemente un no no y los lanzó en la parte posterior de su mente. De cualquier manera, no importa cuánto consejos le dieron, cuántos libros ha leído, usted nunca estará totalmente preparada para traer a casa a su recién nacido y lo que significa desde allí. Tienes que aprender las cuerdas por tu cuenta y averiguar qué funciona para usted y su bebé. Eso es todo parte de ser una mamá e incluso si eres una mamá de primera vez o una madre experimentada llevando a casa a su tercer bebé, cuidar de un recién nacido no es fácil, pero es muy manejable, no tenemos otra opción, jaja! Hoy estoy compartiendo con usted 7 maneras inteligentes de hacer las cosas con un recién nacido porque seamos realistas, la vida continúa y esos platos sucios no se van a limpiar. solos Sí, tener un recién nacido limitará su trabajo y el flujo de tareas domésticas, pero encontrar maneras inteligentes de hacer las cosas en la casa le ayudará a sentirse y ser más productiva. Tener un bebé recién nacido no significa que no puedes hacer nada y todo lo que hace es alimentar, cambiar pañales y dormir a su bebé (aunque pueda sentirse así). No, usted puede hacer más que eso por encontrar caminos ocultos y administrar su tiempo sabiamente. Con mi primogénita, fui a la universidad dos meses después de dar a luz, todavía conseguí cocinar, limpiar la casa, tomar una ducha y mucho más. Es todo acerca de estas 7 formas inteligentes para hacer las cosas con un recién nacido que me ayudó a lograr todas esas cosas y más! ¿Estás lista para ser productiva mientras sigue cuidando a su bebé recién nacido? A continuación, siga leyendo mama, porque estos consejos son super simple, fácil de implementar y eficaz! Usted puede tomar ventaja del tiempo de la siesta, ya sea tomando una siesta usted misma o por ser productivo y utilizar este tiempo sabiamente. Yo recomiendo tomar siesta si tienes que hacerlo o quieres, está bien tomar una siesta de vez en cuando, mientras que su bebé está durmiendo, vaya por él! Ahora, si usted quiere hacer los deberes de la casa, use el tiempo de la siesta a su ventaja. Tomar una ducha, cocinar algo rápido, ordenar la casa, leer un libro o disfrutar de su programa favorito. Realmente puedes hacer muchas cosas mientras tu recién nacido está tomando una siesta. Solía ​​terminar mi trabajo universitario mientras mis hijos estaban durmiendo. También cocinaba e incluso limpiaba mi casa. Concedido que mis hijos tomaban 2 a 3 horas siestas, así que fue genial! Simplemente use la siesta a su ventaja. Cada vez que tomaba una ducha rápido mientras mi bebé recién nacido estaba tomando una siesta, juro que los oia llorar. Realmente pensaba que los estaba escuchando y así saltaba de esa ducha como un gato mojado solo para encontrarlos durmiendo como ángeles pequeños, jajaja. ¡Dime que no era la unica! Así que el tiempo de alimentación es otra forma inteligente de hacer las cosas con un recién nacido. Puedes comprobar sus correos electrónicos de trabajo, puede buscar recetas para el almuerzo o la cena. Incluso puede anotar ideas en su teléfono de lo que debe hacer o su próxima entrada en el blog (si eres un blogger). Si usted va a la escuela, puede comprar los libros que necesitas, hacer una lluvia de ideas de los papeles de término y más. Utilice el tiempo de alimentación a su ventaja tambien, son apenas las pequeñas cosas que pueden diferenciar más adelante. Usted todavía está vinculandose con su bebé pero siendo productiva al mismo tiempo. Solía ​​alimentar a mis bebés con biberon y así es imposible usar el teléfono. Aproveché después de eructarlos y los mesia para dormir en mi silla de balancín favorita. Como mamás siempre encontramos pequeñas maneras inteligentes de hacer que suceda las cosas. Me encantó mantener un ojo en mis recién nacidos y por lo que no dejarlos desatendidos, incluso si estaban felices y tranquilos. Me los llevaba conmigo cuando cocinaba o tomaba una ducha. Los tuve en un columpio o bouncer y fue lo mejor que he hecho. Podía ver lo que estaban haciendo y todavía hacer las cosas del hogar! También me vinculaba con ellos cantándoles y hablando con ellos. Llevaba a mis hijos al baño conmigo, dejaba la puerta del baño abierta y mi recien nacido estaba justo allí. ¿Recuerdas cómo oia sus gritos cada vez que tomaba una ducha? Esta fue mi solución, tomar una ducha mientras estaban despiertos y contentos. Los bebés recién nacidos quieren sentir, ver y oír a su madre, por lo que sólo tómelos con usted y tenerlos en un cómodo baby bouncer o swing! Me encantó mi monitor de bebe porque una vez mi bebé estaba dormido, fácilmente podría verlos y estar a gusta. Un monitor del bebé es grande porque usted no necesita ir al cuarto de su bebe y ver a su recién nacido cada 5 segundos para ver si está bien. Puedes llevar el monitor a cualquier lugar que desee de su casa. Usted puede tener tranquilidad al ser productiva y hacer las cosas. Es asombroso. Me gustaba tomar mi monitor de bebé mientras yo estaba cocinando y sólo mirarlo como si fuera una película mientras cortaba mis verduras y cocinaba mi arroz. Solía ​​tener una rutina mis tres bebés y me encantó. Como usted sabe, los bebés recién nacidos duermen la mayor parte del día, lo cual es increíble y debería funcionar a su favor. Primero cambiaba sus pañales sucios, los alimentaba, los eructaba, y automáticamente se quedaban dormidos. Yo sabia en alrededor de qué hora se quedarían dormidos (por la mañana, por la tarde y por la noche) y por lo que estaba preparada en saber qué cosas quería lograr durante esas pausas de siesta. Mi hija mayor era una niña pequeña cuando mis mellizos nacieron. Ella siempre queria ayudarme a cuidar a los mellizos, que encontré adorables y cariñosos. Le daba tareas fáciles, como simplemente estar al lado de los bebés mientras todos miraban la televisión. Mis mellizos estaban cada uno en su bouncer con su “cinturón de seguridad” (siempre estar en el lado seguro) y mi niña se sentaba en el medio de ellos. Fue increíble para ver, casi no hacia nada, porque yo estaba simplemente mirando a mis adoraciones! Esto me daba alrededor de 15 a 20 minutos para usar el baño, comer y o doblar la ropa limpia. Mi hija también me ayudaba sacando la ropa de sus hermanos antes de bañarlos. Pequeñas tareas que su niño puede ayudar a hacer, le ayudará a hacer más cosas alrededor de la casa. Nunca deje a un niño pequeño desatendido con su recién nacido. Siempre mantener un ojo en ellos y recordarles que estás allí mirando. Los niños son niños y a veces pueden ser un poco ásperos con los bebés recién nacidos. Nunca rechace la ayuda de su familia y amigos que la ofrecen. No pienses que usted tiene que hacer todo usted misma, porque entonces se sentirá agotada y será incapaz de hacer las cosas. Acepta y disfruta, toma una ducha mientras tienes compañía ayudandote, usa un poco de maquillaje, haz tu cabello. Preguntele a su esposo, tambien a su mamá, hermanas cualquier persona que vive cerca de usted que la ayude y no se sienta avergonzado de eso. Allí lo tienes mamá, maneras simples y inteligentes de hacer las cosas con un recién nacido. Espero que hayas disfrutado de esta lectura y la haya encontrado útil. ¿Tiene más sugerencias para agregar a la lista? ¡Por favor hagamelo saber! You are not the only one who used to jump out of the shower like a wet cat! Lol. Isn’t it funny that we would hear them but really it’s just our minds playing tricks. 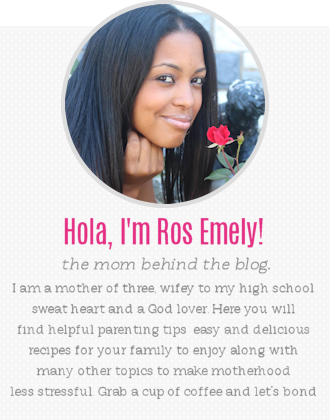 These are great tips Ros Emely. My sister will have her third son this May, I’m going to send her a link to this post. With my daughter, we held her so much to the point where she ALWAYS wanted to be held or she would scream. So your first tip is right on! Thanks Crystal, I’m glad I’m not the only one, haha! Thank you so much for sharing these tips with your sister, it means a lot 🙂 Yes girl,babies get used to the arms really quick and then like you said,only want to be held. I’m glad you found my tips helpful ! 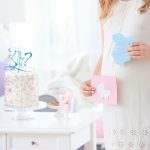 These are great tips, and a good reminder for me now that our little man is here! haha! Right? I laugh every time I think about that too. It’s crazy how we think we “hear” our children but in reality is all in our heads. God bless and congratulations on baby #3! (resistance training and keeps them warm in cool weather), or for shopping. On the back works better around home. My best friend is about to have her first child. She is wondering how she will still get everything done once she does give birth. I liked that you pointed out that she could ask for help from other people if she needs help. It might also be smart for her to look for an infant care service to help her out as she is adjusting to being a mother.